Sitting squarely in the heart of Southside Village, Sarasota, Knick’s Tavern & Grill is a casual neighborhood retreat with friendly service, a large assortment of wines and beer, solid comfort cuisine, and doggie friendly outdoor dining. 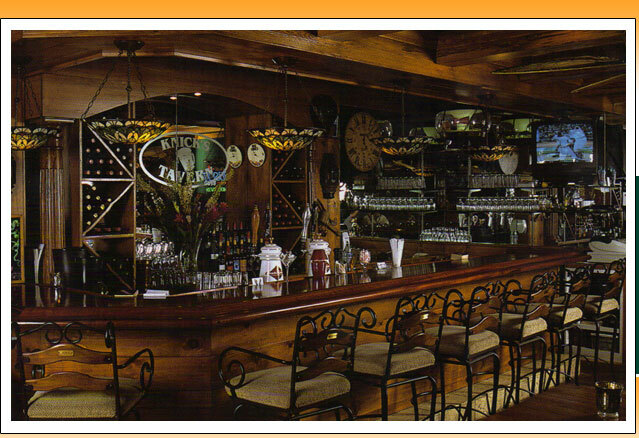 Some call us the “Cheers” of Sarasota…the bar stools and tables even have plaques with locals names engraved. Whether ordering a hot dog, one of Knick’s world-class burgers, or perhaps the signature New York strip, rest assured you’re getting the best. Knick’s Tavern and Grill only uses 100% Certified Angus Meat for all of our products. The Famous Knick’s Salad, a garden salad with smoked Gouda, fresh and dried fruit with in-house roasted walnuts in balsamic vinaigrette offers an enticing and refreshing approach to any meal. This too is a local favorite. We also make a damn fine chicken wing. In addition to the superb meat and seafood items, Knick’s provides appetizing options for vegetarians. Daily specials such as Monday’s chicken pot pie (in a philo curst like you’ve never seen), Wednesday’s meatloaf (better than mom’s), and prime rib on Fridays. Homemade dessert selections morph on a daily basis as well. The bar ambiance offers an ideal setting for a blend of live and leisurely conversation. The entire staff takes a genuine interest in the patrons, and is always very eager to engage. Topics ranging from food and wine, to politics, to local gossip assure patrons that nothing is taboo at Knick’s. A hand-picked wine list and extensive beer selection help to fuel the nightly banter. Food, drink, stellar management and staff, and ambiance. As a total package, Knick’s Tavern leaves its epicurious audience pleased and satisfied- a feat sure to inspire an encore.